Lincoln will host a unique exhibition in venues across the city from 27th June to 27th September. Lincolnshire’s Great Exhibition will be displayed in five venues. In the David P J Ross Magna Carta Vault there will be one of the very rare copies of the definitive 1225 Henry III Magna Carta. In the Wren and Medieval Libraries of the Cathedral there will be manuscripts and printed books. For the first time in 400 years the two volumes of the Chapter Bible will be displayed side by side. Other artefacts will be on display across the city. The Historic Lincoln Trust has worked closely with the Royal Collection, the British Library, the National Archives, the Victoria & Albert Museum, the National Portrait Gallery, and other great public and private collections to create the greatest exhibition ever staged in Lincolnshire. Click here for more information about the Great Exhibition. •	13th – 14th June: Across the weekend, Lincoln’s famous Steep Hill Street will come alive with the story of King John as told by the country’s best storytellers – from rap artists to local performers. •	13th – 14th June: The Night of Festivals, at Brayford Waterfront. Every 45 minutes, spectators will witness carnivals featuring giant puppets, fireworks, and live musicians. Saturday 10:00 – 20:00, Sunday 11:00 – 16:00. •	14th June: ‘Barmy Britain Part 2’, a free Horrible Histories show including a brand new Magna Carta sketch. •	14th June: Britain’s Got Talent winners Diversity are the headline act at a Magna Party Concert at Lincoln Castle. 20:00 – 22:00. •	15th June: A carnival procession featuring a giant King John. Click here for more information about the Great Magna Carta Weekend. 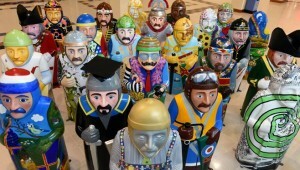 6 feet sculptures of Barons, 25 in all, have been decorated by artists from Lincolnshire and beyond. Local businesses and organisations have worked with the artists to devise a different theme for each Baron, including a Squadron Leader Baron, the Mayor of Lincoln Baron and even a Steampunk Baron. From the 12th June – 6th September, the finished sculptures will be placed around the city centre, creating a colourful and fun trail for visitors to follow. Each one is marked with a letter – when all the letters are collected, they form a phrase that can be deciphered in exchange for some of King John’s gold (chocolate!) coins. The Baron’s Charter Trail is a ‘Wild in Art’ event brought to Lincoln by The Trussell Trust and Lincoln BIG. The sculptures will be displayed for three months, before being auctioned with all proceeds from the sales donated to The Trussell Trust, the national foodbank charity. This is a Magna Carta 800th funded project. Click here for more information. From Thursday 18th June to Sunday 21st June there will be choral and other music at Lincoln Cathedral. A full listing of performances can be downloaded here:Lincoln -E3C Music List Mar 2015. Lincoln Cathedral is working in partnership with Lincoln Castle to provide a new permanent interactive exhibition for its 1215 Magna Carta. Lincoln Castle (itself built by William the Conqueror) stands opposite Lincoln Cathedral with the site of the Battle of Lincoln Fair lying in between. By 2015 a new vault will be provided at Lincoln Castle where Magna Carta (1215) and Charter of the Forest (1217) will be displayed in suitable environmental and secure conditions. A full height enveloping cinematic auditorium will be the primary vehicle for providing in-depth content about Magna Carta, Charter of the Forest, and the deciding Battle of Lincoln Fair against Prince Louis of France in 1217 that followed King John’s death. A series of films projected onto a curved 180 degree screen will immerse visitors in medieval battles, momentous occasions in the history of liberty and justice, and fights for rights today. The £20 million restoration which, in addition to the new home for Magna Carta, offers the opportunity to walk the full circumference of the wall, to explore its eighteenth and nineteenth century prisons (including scenes from Downton Abbey) and to see the results of the archaeology revealed in the restoration, including objects from a previously undiscovered early Saxon Church. Lincoln’s Magna Carta also toured the US in 2014. To find out more, please click here. More information can also be found here at Visit Lincoln. As a seat of learning, the University of Lincoln is also central to the city’s Magna Carta 2015 celebrations. The University enjoys a close relationship with Lincoln Cathedral, which is the setting for its graduation ceremonies and offers a rich resource for academic researchers and students. With its noted specialisms in medieval history and historical studies, the University will contribute to regional, national and international endeavours to build understanding and awareness of the significance of Magna Carta. The University of Lincoln has declared 2015 its Year of Liberty and, working alongside its partners across the city and the Magna Carta 800th Committee, is planning a series of commemorative activities, including free public lectures, arts and cultural events, conferences, competitions and scholarship awards. As part of these 800th celebrations, Lincoln record Society and the University of Lincoln are delighted to co-sponsor an international conference on Magna Carta at the University of Lincoln on the 7-9th April 2015. The conference will include a keynote address from one of the leading scholars on Magna Carta, Professor David Carpenter, and academics working in areas of medieval law and society upon which Magna Carta, and the assumptions and myths which grew up around it, had an influence. Delegates will have the option to attend a conference dinner in the Chapter house at Lincoln Cathedral on Wednesday night. On Tuesday night it will also be possible to attend a sung evensong at Langton-by-Wragby, home parish of Stephen Langton, the archbishop of Canterbury said to have influenced the terms of the charter. There will be opportunities on Thursday morning to take a walking tour of Lincoln, to visit the Lincoln Cathedral Library or to take a tour of the new display of the Lincoln Magna Carta at Lincoln Cathedral. places on all these events will be limited. Esteemed experts on Law and Magna Carta will deliver a series of lectures throughout 2015. For more information on a particular event, including ticket availability, please click on the below listings. – 27th March: Speaker Roly Keating, Chief Executive of the British Library, at University of Lincoln – click here for more information. – 17th June: Annual Magna Carta Lecture – click here for more information. – 16th July: Mark Carney, Governor of the Bank of England, Lecture Title TBA, Lincoln Cathedral.